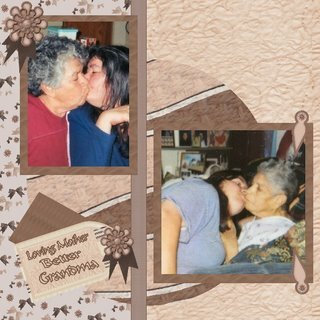 this is me my mom and my grandma. my grandma was a very loving person and we were sad to see her go to that deep sleep, but we know in our hearts that we will see her soon. love you grandma. this is another quick page made by my friend. check out her blog of her freebies there she is first on my other blogs list. she is a really good designer and needs a place to sell when she's ready so if you like her designs and know of a place for her to sell let her or me know. thank you so much. comments are welcomed. Wow...that looks great Helen and thank you so very much for using my qp!!! Also, thanks for be my #1 Spokesperson! Hehehe! Got here Helen, great layout. Looks very nicely done. Love how you used Michaele's qp with the great pics of your Grandma! Keep up the good work!